The foundation you choose for your new home boils down to personal preference and budget. Which foundation gets you the home you want at a price that makes sense? By definition a home’s foundation is the load-bearing portion of the structure, typically built below ground. That’s pretty much it. But, like everything in homebuilding, you have choices. Luckily, those choices are pretty straightforward, and their relative advantages and disadvantages are crystal clear. And while deciding what type of foundation is right for your home isn’t the most exciting part of planning your build, it’s undoubtedly one of the most important (and earliest) steps. For the sake of keeping this article organized, we’ll discuss the three types of foundations you’re most likely to encounter in this market, starting with the least expensive, slabs. 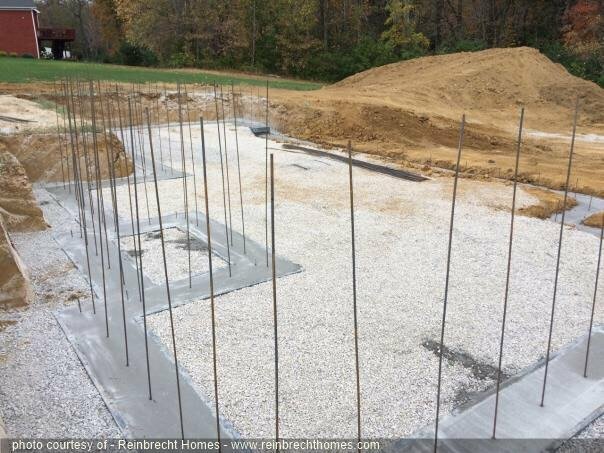 A slab is one of the most common types of foundations, requiring the least amount of lot prep to begin building. Installation is simple compared to other foundation-types, making slab foundations popular among homeowners for their relatively low price tag. Like all foundations, the slab starts with concrete footers poured 24 inches below projected finish grade. After the footers are poured, a minimum of two layers of concrete block are laid on top of the footers. After the blocks are laid all internal piping is installed. Then a rock filler is added, followed by four inches of concrete poured on top. Pictured: The same home, with a slab foundation, after the footers have been poured and block laid. At this stage, it is ready for the plumbing to be run, full rock added and then the concrete poured. Price: Generally, slab foundations are your cheapest option when it comes to foundations, an excellent choice if budget is front-of-mind. Low Maintenance: Of all foundation-types, slabs require the least amount of maintenance, adding to their pricing value. Potentially Expensive Repairs: Plumbing systems are buried BELOW the slab, making repairs costly as you’ll have to first break through the concrete slab to reach the piping. However, with the new technology, like pex plumbing systems, increasingly used by builders, the eventual need to access below your slab is far less likely than in the past. Bad Weather: Slabs offer minimal protection to your home from storms and other inclement weather events. As with all foundations, builders should always ensure proper drainage away from the structure to ensure protection from moisture and runoff damage. Homes with a crawlspace foundation are elevated a few feet off the ground. Like a slab, a footing is poured, then blocks are laid to create the foundation to support the walls of the structure. Building a crawlspace foundation will save on cost compared to a basement, but not necessarily time, as they take about as much time to build as a full basement foundation. Accessible Utilities: Resolving the slab’s biggest drawback, a crawlspace facilitates easier access to your home’s wiring, piping, and ductwork, making for easy repairs and future upgrades. Warmer Floors: Unlike a slab foundation, the first floor of a home built on a crawlspace won’t feel like it’s built on concrete. In fact, the floors tend to be warmer because crawlspace is conditioned. Prone to Moisture: Even with the installation of cutting-edge vapor barriers, it is still possible for crawlspaces to support the growth of mold and fungi. You’ll want to keep an eye on your crawlspace for this reason. In the case of Reinbrecht Homes, our conditioned crawlspaces further help to moisture problems at bay. Little Protection from Storms: Like slab foundations, crawlspaces offer the structure of your home little-to-no protection from inclement weather. It’s imperative to insulate the exterior walls of your crawlspace. A basement, in literal terms, is an eight-foot (or deeper) hole that ends in a concrete slab. For a long time, basement walls were built with cinder blocks. As a result, they were prone to structural failures and leaks as they aged. 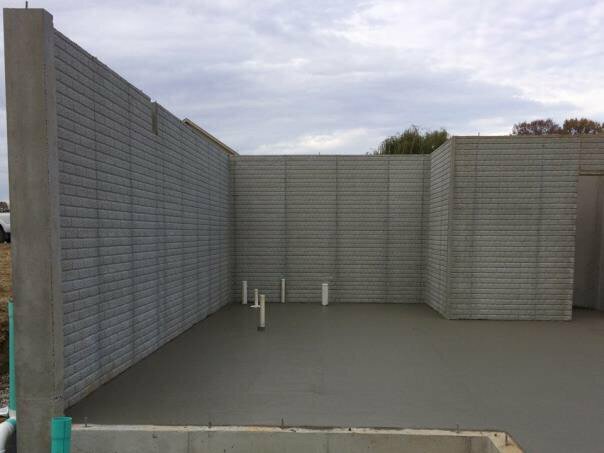 These days, and specifically at Reinbrecht Homes, all are built with poured concrete walls, which have virtually eliminated most problems related to structural integrity and moisture permeation. Basements are excellent for anchoring a property to the ground while extending the foundation below the area’s frost line, which helps maintain the integrity of the foundation over time. More, Cheap Square Footage: Arguably the greatest advantage to a basement foundation is the additional square-footage gained — and at a much lower cost per square foot than other parts of the home. Seasonal Living Space: Great for smaller-footprint homes, the addition of a finished basement creates energy-efficient living spaces that pair well with changing seasons, staying warm in winter and cool in summer. Easy-Access for Repairs: It goes without saying that it’s easier (and cheaper) for technicians to make repairs to your home’s utilities standing up rather than crawling in a crawlspace or digging into a slab. Storm Protection: For both you, the residents, as well as your home. Basements make great shelters from the worst mother nature can throw at you, while still providing a solid anchor for your home. Increased Cost: A basement is understandably the most expensive foundation-type of the three mentioned here — more so if you choose to finish that space. Even then, that finished basement square footage will most likely be the least expensive in your entire home. Potential Flooding: Without a sump pump, you may end up with a flooded basement. To combat (and virtually eliminate the threat of) flooding, we recommend battery backup, generators or water-flow backups. In all cases, though, the best scenario to prevent potential flooding is ensuring a natural path for drainage. Lack of Natural Light: If you’re converting your basement into a living space, and it’s NOT a walkout, you might have to find creative ways of bringing some light into the space. Again, this isn’t an issue with walkout basements. Pictured: A walkout basement just after the floor was poured. It’s worth noting that, if they’re built correctly, there is no foundation type that should “hold up” better than the others in terms of longevity. Similarly, besides the topography of your lot, there really isn’t a major reason to choose one over another based on geography or soil-type. Your decision on which foundation to use in your new home boils down to personal preference and budget. What foundation-type gets you the home you want at a price that makes sense? To discuss a new home or remodel, send us an email and our staff will contact you directly!